The university is classified as a Research University with Very High Research by the Carnegie Foundation for the Advancement of Teaching. The university comprises 16 separate colleges and more than 110 centers, facilities, labs and institutes that offer more than 360 programs of study, including professional school programs. The university has an annual budget of over $1.7 billion and an annual economic impact of over $10 billion. Florida State is home to Florida's only National Laboratory, the National High Magnetic Field Laboratory, and is the birthplace of the commercially viable anti-cancer drug Taxol. Florida State University also operates The John & Mable Ringling Museum of Art, the State Art Museum of Florida and one of the largest museum/university complexes in the nation. The university is accredited by the Southern Association of Colleges and Schools (SACS). For 2019, U.S. News & World Report ranked Florida State as the 26th best public university in the United States in the national university category. Florida State University is one of Florida's three state-designated "preeminent universities." 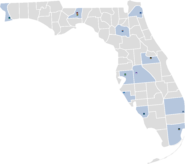 In 1819 the Florida Territory was ceded to the United States by Spain as an element of the Adams–Onís Treaty. The Territory was conventionally split by the Appalachicola or later the Suwannee rivers into East and West areas. Florida State University is traceable to a plan set by the 1823 U.S. Congress to create a system of higher education. The 1838 Florida Constitution codified the basic system by providing for land allocated for the schools. In 1845 Florida became the 27th State of the United States, which permitted the resources and intent of the 1823 Congress regarding education in Florida to be implemented. Returning soldiers using the G.I. Bill after World War II stressed the state university system to the point that a Tallahassee Branch of the University of Florida (TBUF) was opened on the campus of the Florida State College for Women with the men housed in barracks on nearby Dale Mabry Field. By 1947 the Florida Legislature returned the FSCW to coeducational status and designated it Florida State University. The FSU West Campus land and barracks plus other areas continually used as an airport later became the location of the Tallahassee Community College. The post-war years brought substantial growth and development to the university as many departments and colleges were added including Business, Journalism (discontinued in 1959), Library Science, Nursing and Social Welfare. Strozier Library, Tully Gymnasium and the original parts of the Business building were also built at this time. The Florida State University College of Medicine was created in June 2000. It received provisional accreditation by the Liaison Committee on Medical Education on October 17, 2002, and full accreditation on February 3, 2005. The King Life Sciences Building, which sits next to the College of Medicine, was completed in June 2008, bringing all the biological sciences departments under one roof. As of 2018 [update], FSU's financial endowment (the "University Endowment Fund") was valued at $742 million. The endowment is primarily used according to the donors' wishes, which include the support of teaching and research. The student government was established in 1935 and consists of executive, judicial, and legislative branches. The student government executive branch is led by the Student Body President and includes the Student Body Vice President, Student Body Treasurer, six agencies, seven bureaus, and executive secretaries within the Executive Office of the President. The student government judicial branch has two major components: the Supreme Court of the Student Body (headed by a Chief Justice) and all elections related officials such as the Supervisor of Elections and the Elections Commission. The Supreme Court consists of seven second or third-year students at the FSU College of Law nominated by the Student Body President and confirmed by the Student Senate. Each justice serves a "life-time" term, which extends through the individual justice's graduation and insulates the court from the politics of student government. The Chief Justice may appoint a marshal and clerk. The election commission is also composed of Florida State University College of Law students and it adjudicates all student government election complaints. The commission has five members, one of whom also serves as the commission chairman. Florida State University aspires to become a top twenty-five public research university with at least one-third of its PhD programs ranked in the top 15 nationally. The university owns more than 1,600 acres (6.4 km²) and is the home of the National High Magnetic Field Laboratory among other advanced research facilities. The university continues to develop in its capacity as a leader in Florida graduate research. Other milestones at the university include the first ETA10-G/8 supercomputer,  capable of 10.8 GFLOPS in 1989, remarkable for the time in that it exceeded the existing speed record of the Cray-2/8, located at the Lawrence Livermore National Laboratory by a substantial leap and the development of the anti-cancer drug Taxol. Florida State University has a nationally recognized honors program. The University Honors Office supports the university's long tradition of academic excellence by offering two programs, the University Honors Program and the Honors in the Major Program, which highlight the institution's strengths in teaching, research, and community service. The Honors Program also offers special scholarships, internships, research, and study abroad opportunities. Admission into the University Honors Program is by invitation only. The average academic profile of students that were offered honors invitations in 2015 was as follows: 4.2 weighted GPA; 32 ACT composite; 2080 SAT total. For the Honors in the Major Program students, the University Honors Office requires that prospective students have at least sixty semester hours and at least a 3.2 cumulative FSU GPA. The Honors program offers students housing in Landis Hall and Gilchrist Hall. Landis Hall is the traditional home of Honors students since 1955, which is situated on Landis Green at the heart of FSU's main campus. Gilchrist Hall also houses Honors students and is located adjacent to Landis Hall. Florida State University's International Programs (FSU IP) is ranked 11th in the nation among university study abroad programs. Every year Florida State consistently sends over 2,379 students across the world to study in multiple locations. As a student of IP, students are able to take classes that meet their major and/or minor requirements, study with experts in their field, and earn FSU credit. The Florida State University Career Center is located in the Dunlap Success Center. Its mission is to provide comprehensive career services to students, alumni, employers, faculty/staff and other members of the FSU community. These services involve on and off-campus job interviews, career planning, assistance in applying to graduate and professional schools, internships, fellowships, co-op placements, research, and career portfolio resources. The Career Center offers workshops, information sessions, and career fairs. Staff at the FSU Career Center advise students and alumni regarding resumes and portfolios, tactics for job interviews, cover letters, job strategies and other potential leads for finding employment in the corporate, academic, and government sectors. As of 2017, CARE had a first-year retention rate of 97 percent and had an 81 percent six-year graduation rate. The average first term college GPA of CARE students throughout the inception of the program is 3.1. The Summer Bridge Program (SBP) is an alternative admission program for disadvantaged first generation students. The seven-week program helps students transition from high school by providing an early move-in date for easier acclimation, along with group activities managed by peer ambassadors who have already gone through the program. The Harold Goldstein Library on the main campus houses a collection of approximately 82,000 books, videos and CDs relating to library and information science, information technology, and juvenile literature. The largest part of the collection consists of professional and reference materials as well as juvenile and easy books. Florida State currently has 19 graduate degree programs in interdisciplinary research fields. Interdisciplinary programs merge disciplines into common areas where discoveries may be exploited by more than one method. Interdisciplinary research at FSU covers traditional subjects like chemistry, physics and engineering to social sciences. The National High Magnetic Field Laboratory (NHMFL) or "Mag Lab" at Florida State develops and operates high magnetic field facilities that scientists use for research in physics, biology, bioengineering, chemistry, geochemistry, biochemistry, materials science, and engineering. It is the only facility of its kind in the United States and one of only nine in the world. Fourteen world records have been set at the Mag Lab to date. The Magnetic Field Laboratory is a 440,000 sq. ft (40,877 square meter) complex employing 507 faculty, staff, graduate, and postdoctoral students. This facility is the largest and highest powered laboratory of its kind in the world and produces the highest continuous magnetic fields. The university's colors are garnet and gold. The colors of garnet and gold represent a merging of the university's past. While the school fielded a football team as early, or earlier than 1899,  in 1902, 1903 and 1905 the team won football championships wearing purple and gold uniforms. The following year, the college student body selected crimson as the official school color. The administration in 1905 took crimson and combined it with the recognizable purple of the championship football teams to achieve the color garnet. After World War II the garnet and gold colors were first worn by a renewed football team in a 14–6 loss to Stetson University on October 18, 1947. Florida State University's marching band is the Marching Chiefs. Florida State University provides 6,733 undergraduate and graduate students with housing as well as living–Learning Communities (LLC) on the main campus. This number will soon be expanded to 7,283 with new housing projects. Florida State University is a traditional residential university wherein most students live on campus in university residence halls or nearby in privately owned residence halls, apartments and residences. Florida State currently has 18 residence halls on campus, housing undergraduate, graduate and international students. FSU offers suite-style and apartment-style residence halls. Students who are active members of the FSU Greek System may live in chapter housing near campus. There is also a vast amount of off-campus housing options throughout Tallahassee for students to choose from. Florida State University has more than 700 organizations and clubs for students to join. They range from cultural and athletic to philanthropy, including Phi Beta Kappa, AcaBelles, Garnet and Gold Scholar Society, Marching Chiefs, Garnet Girls Competitive Cheerleading, Florida State Golden Girls, FSU Pow Wow, FSU Majorettes, Hillel at FSU, Seminole Flying Club, No Bears Allowed, FSU Student Foundation, InternatioNole, Student Alumni Association, Hispanic/Latino Student Union, Relay For Life, The Big Event at FSU, Por Colombia, Quidditch at FSU, and the Men's Soccer Club. All organizations are funded through the SGA and many put on events throughout the year. Students may create their own registered student organization if the current interest or concern is not addressed by the previously established entities. The Bobby E. Leach Student Recreation Center is a 120,000 square foot fitness facility located right in the heart of campus. Construction on the Center was completed in 1991. The Leach Center has three regulation-size basketball courts on the upper level with the third court being designated for other sports such as volleyball, table tennis, and badminton. It also has five racquetball & squash courts for recreational matches and an indoor track overlooking the pool on the third level of the facility. Over 6,500 students are members of either a fraternity or sorority. The Office of Greek Life at Florida State University encompasses the Interfraternity Council (IFC), Panhellenic Council (NPC), Multicultural Greek Council (MGC), and the National Pan-Hellenic Council (NPHC). The Order of Omega and Rho Lambda Honor Societies also have chapters at Florida State. The Multicultural Greek Council consists of 11 cultural organizations (Latino, Asian, South Asian, etc.). The National Pan-Hellenic Council comprises 8 historically black organizations. The campus newspaper, the FSView & Florida Flambeau, is 100 years old now and publishes weekly during the summer and semiweekly on Mondays and Thursdays during the school year following the academic calendar. After changing hands three times in 13 years, the FSView was sold to the Tallahassee Democrat in late July 2006, making it part of the Gannett chain. This exchange was allowed because the FSView had been for a long time a for-profit business that was not legally associated with Florida State University. Since most collegiate newspapers are supported by their colleges, this was also among the first times that a major corporation had acquired a college newspaper. FSU operates two television stations, WFSU and WFSG,  and three radio stations, WFSU-FM, WFSQ-FM and WFSW-FM. FSU operates a fourth radio station, WVFS (V89, "The Voice", or "The Voice of Florida State"), as an on-campus instructional radio station staffed by student and community volunteers. WVFS broadcasts primarily independent music as an alternative to regular radio. The school's athletic teams are called the Seminoles, derived from the Seminole people. The name was chosen by students in 1947 and is officially sanctioned by the Seminole Tribe of Florida;  the Seminole Nation of Oklahoma has taken no official position regarding the university's use of the name. Florida State's athletes participate in the NCAA's Division I (Bowl Subdivision for football) and in the Atlantic Coast Conference. For the 2017–18 school year, the Florida State Athletics Department budgeted $103.2 million for its sports teams and facilities and currently brings in over $121.3 million in revenues. Florida State University is known for its competitive athletics in both men's and women's sports competitions. The men's program consists of baseball, basketball, cross country running, football, golf, swimming, tennis, and track & field. The women's program consists of basketball, cross country running, golf, soccer, softball, swimming, tennis, track & field, and volleyball. FSU's Intercollegiate Club sports include bowling, crew, rugby, soccer and lacrosse. Harkins Field is an artificial turf field that is home to the lacrosse team as well as serving as the practice field for the Marching Chiefs of the College of Music and the football team. Florida State University has been penalized seven times by the NCAA for major infractions for the period 1968 through 2009. These infractions range from improper recruiting of student-athletes, failure to investigate adequately to academic fraud. FSU has been penalized by the NCAA according to each violation of rules. The Seminoles' home field is Bobby Bowden Field at Doak Campbell Stadium, which has a capacity of 79,560. The stadium first opened in 1950 with a capacity of 15,000. In 2015, construction began on a project to completely renovate Doak Campbell Stadium as part of the $250 million Florida State Seminoles Champions Campaign to improve all aspects of athletics. The project added new premium outdoor seating sections, structural repairs, a repainting of the stadium, and updated sky box suites. The most recent addition of the stadium was completed in 2016 which replaced two video boards. The 9,368 square feet north video board is the largest video board in the state of Florida and the second largest in the nation. The stadium is popularly known as "Doak." Florida State University fielded its first official varsity football team in the fall of 1902 until 1904, which were then known as "The Eleven". The team went (7–6–1) over the 1902–1904 seasons posting a record of (3–1) against their rivals from the Florida Agricultural College in Lake City. In 1904 the Florida State football team became the first ever state champions of Florida after beating both the Florida Agricultural College and Stetson University. The football team and all male students subsequently moved to the newly opened University of Florida in Gainesville in 1906 as a result of the 1905 Buckman Act. Football returned to Florida State after World War II in 1947. Under head coach Bobby Bowden, the Seminole football team became one of the nation's most competitive college football teams. The Seminoles played in five national championship games between 1993 and 2001 and won the championship in 1993 and 1999. The FSU football team was the most successful team in college football during the 1990s, boasting an 89% winning percentage. Bobby Bowden would retire with the record for most all-time career wins in Division I football. Jimbo Fisher succeeded Bowden as head coach in 2010. FSU football is well known for introducing talented players into the NFL. The FSU men's Track & Field team won the Atlantic Coast Conference championship four times running, in addition to winning the NCAA National Championship three consecutive years. In 2006 Head Coach Bob Braman and Associate Head Coach Harlis Meaders helped lead individual champions in the 200 m (Walter Dix), the triple jump (Raqeef Curry), and the shot put ( Garrett Johnson). Individual runners-up were Walter Dix in the 100 m, Ricardo Chambers in the 400 m, and Tom Lancashire in the 1500 m. Others scoring points in the National Championship were Michael Ray Garvin in the 200 m (8th), Andrew Lemoncello in the 3000 m steeplechase (4th), Raqeef Curry in the long jump (6th), and Garrett Johnson in the discus (5th). In 2007, FSU won its second straight men's Track & Field NCAA National Championship when Dix became the first person to hold the individual title in the 100 m, 200 m, and 400 m at the same time. Florida State has had 34 athletes compete at the Olympics in their respective events, most recently having ten athletes compete in the 2008 Beijing Olympics. Those athletes included Gonzalo Barroilhet (Chile), Ricardo Chambers (Jamaica), Refeeq Curry (USA), Walter Dix (USA), Brian Dzingai (Zimbabwe), Tom Lancashire (England), Andrew Lemoncello, (England), Ngoni Makusha (Zimbabwe), Barbara Parker (England), and Dorian Scott (Jamaica). Walter Dix earned two bronze medals (100 m & 200m) at the Olympic Games. Florida State's Department of Art includes many distinguished faculty. Mark Messersmith, Lillian Garcia-Roig, and Emeritus Professor Ray Burggraf are renowned for environmentally-focused paintings and "color constructions" that continue to inspire debate among scholars. Together, Messersmith, Garcia-Roig, and Burggraf created an exhibition called, A Mysterious Clarity. It debuted at the 621 Gallery in 2004 (Tallahassee, Florida), and by popular demand, quickly evolved into a traveling show. To date, A Mysterious Clarity has been featured in at least 9 museums and galleries including the Albany Museum of Art, the Gulf Coast Museum, and the Brevard Art Museum. Florida State University currently has 372,025 alumni as of April 2018 [update] and has produced five Rhodes Scholars. Florida State alumni can be found in all 50 states and many countries all over the world. FSU has almost thirty college and university presidents who are alumni. This institution has produced over fifteen members of the United States Congress, Florida Legislature, numerous U.S. ambassadors, four governors, and over twenty generals and admirals for the United States Armed Forces. Over 15 FSU graduates have served in the U.S. Senate and U.S. House of Representatives, including senators Thomas Gallen, Mel Martinez and Kay Hagan in addition to representatives Jason Altmire and Allen Boyd. FSU has 4 alumni that have been governors including Governors of Florida Charlie Crist and Reubin Askew and Governors of Maryland Parris Glendening and Larry Hogan. Over 12 alumni have been mayors, including Teresa Jacobs, Art Agnos and John Marks. congressional chiefs of staff Benjamin McKay and B. Dan Berger. Foreign FSU politicians include Mokgweetsi Masisi, the current President of Botswana, Briton Mo Mowlam, and Vietnamese dissident Doan Viet Hoat. Among the many notable lawyers and jurists that have attended FSU are judges Susan Black and Ricky Polston, along with lawyer Bruce Jacob. Notable military alumni include generals Frank Hagenbeck and Kenneth Minihan and U.S. Army officer Col. William Wood, the highest ranking United States military casualty in Iraq combat as well as administrator and former POW Orson Swindle. As a major competitor in college athletics, Florida State University has many notable alumni including student athletes, coaches and staff members. Many of the most notable members are listed in FSU's Hall of Fame and represent all major collegiate sports. A number of FSU alumni have found success in professional sports, with 123 active alumni competing in sports including basketball, football, baseball and golf. In addition, FSU has produced three Heisman Trophy winners in Chris Weinke, Charlie Ward, and Jameis Winston. Notable Seminoles in professional golf include Brooks Koepka, back to back U.S. Open champion ( 2017, 2018), Jeff Sluman, and Hubert Green, and Paul Azinger, PGA Championship( 1993) and Ryder Cup Captain( 2008). ^ Divya Kumar, " Governor signs bill to grant UF, FSU preeminence", The Oracle (April 23, 2013). Retrieved May 25, 2015. ^ Lynn Hatter, " FSU, UF Become Florida's 'Preeminent' Universities", WFSU (June 10, 3013). Retrieved May 26, 2015. ^ 621 Gallery, Archive, 2004, A Mysterious Clarity < http://www.621gallery.org/exhibitionsevents/archive/2004.html> Accessed March 2013.